Page Action is a feature to directly invoke a Page method from the browser. 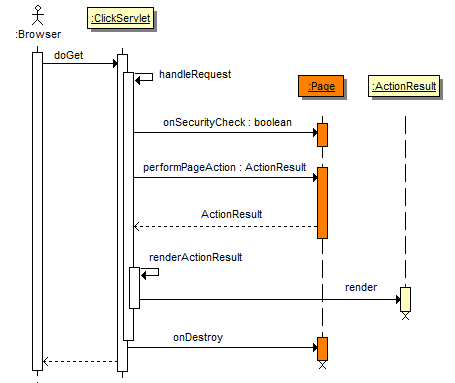 The Page Action method returns an ActionResult object that is rendered directly to the browser. In other words the Page template will not be rendered. To invoke a Page Action, specify the parameter "pageAction" and the name of the page method, for example: "onRenderImage". Let's take a quick look at how a Page Action can be leveraged to retrieve an image. In this example we'll create an HTML <img> element which src attribute specifies the Page Action that will return the image data. The ActionResult contains the data that is rendered to the client browser. In the example above, the result will the Image byte array with a Content-Type of: "images/png". Page Actions are page methods that handle the processing of a user request and render a result to the browser. The execution sequence for a Page Action being processed and rendered is illustrated in the figure below. Stepping through this Page Action request sequence, a new Page instance is created and the attributes for the Page are set (format, headers). Next, request parameter values are bound to matching Page fields. Then the onSecurityCheck() handler is executed. This method can be used to ensure the user is authorized to access the Page Action, and if necessary abort any further processing. If onSecurityCheck() return false, no response is sent back to the client. Note, if you want to send a specific response to the client you have to do that from the onSecurityCheck() event, since other Page events are not executed. Please see this example for some strategies on implementing onSecurityCheck to handle ajax requests. Next the target page method is invoked which returns an ActionResult that is rendered to the client. If the page method returns null no response is rendered to the browser. An ActionResult represents the content returned by a Page Action which is then rendered to the client browser. ActionResults normally contains HTML or image data that is rendered to the browser. When a Page Action is invoked the Page template rendering is bypassed and only the ActionResult content is rendered to the browser. This allows a Page Action to return a "partial" response, as opposed to a "full" response, because the Page template (which can be viewed as a "full" response) is bypassed when invoking a Page Action. The browser renders the <img> element and requests the image src url. Click invokes the page method getImageData and renders the result to the browser. When handling a Page Action you might need to set the HTTP response headers or status code. You do this through the Servlet API's, HttpServetlResponse which can be accessed through the Context.